An interior architecture project, the existing condition was a street front tenancy at the base of a new residential tower, overlooking the South Yarra train station. 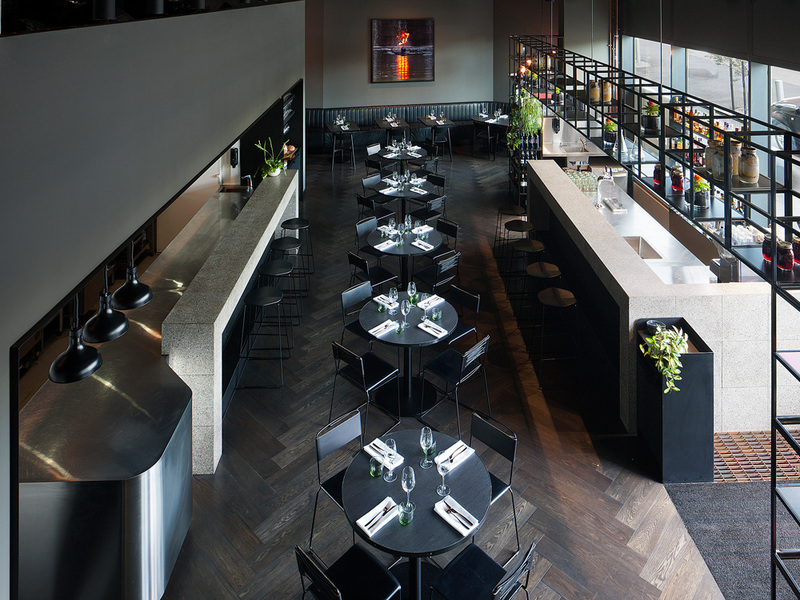 Molecule’s brief was to create an interior for a new restaurant, providing a dining room, open bar and kitchen, guest bathrooms and a mezzanine storage space. The design challenge was conceiving an open-all-hours dining destination that enjoyed from its launch the timeless (yet memorable) quality of a neighbourhood ‘institution’; the response was to celebrate its unique location and reference the raw, honest beauty of historical railway terminals. A moody palette of matte industrial materials including mild steel, terrazzo and timber parquetry offers refuge from the brightness and activity of the station outside. New walls to a mid-height datum achieve a sense of the space being ‘dipped’, clarifying the relationship between the untreated concrete shell and the highly-treated restaurant installed within. Aside a suite of inky furniture, the space is anchored by a large steel ‘gantry’, framing views of passing trains while providing a structured, transit-inspired element for storage and display.